Abstract. This paper presents the findings from a study aimed at understanding whether video games (or serious games) can be effective in enhancing volcanic hazard education and communication. Using the eastern Caribbean island of St. Vincent, we have developed a video game – St. Vincent's Volcano – for use in existing volcano education and outreach sessions. Its twin aims are to improve residents' knowledge of potential future eruptive hazards (ash fall, pyroclastic flows and lahars) and to integrate traditional methods of education in a more interactive manner. Here, we discuss the process of game development including concept design through to the final implementation on St. Vincent. Preliminary results obtained from the final implementation (through pre- and post-test knowledge quizzes) for both student and adult participants provide indications that a video game of this style may be effective in improving a learner's knowledge. Both groups of participants demonstrated a post-test increase in their knowledge quiz score of 9.3% for adults and 8.3% for students and, when plotted as learning gains (Hake, 1998), show similar overall improvements (0.11 for adults and 0.09 for students). These preliminary findings may provide a sound foundation for the increased integration of emerging technologies within traditional education sessions. This paper also shares some of the challenges and lessons learnt throughout the development and testing processes and provides recommendations for researchers looking to pursue a similar study. 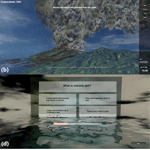 How to cite: Mani, L., Cole, P. D., and Stewart, I.: Using video games for volcanic hazard education and communication: an assessment of the method and preliminary results, Nat. Hazards Earth Syst. Sci., 16, 1673-1689, https://doi.org/10.5194/nhess-16-1673-2016, 2016. Here, we aim to better understand the potential for using video games in volcanic hazard education with at-risk communities. A study using a bespoke-designed video game – St. Vincent's Volcano – was trialled on the Caribbean island of St. Vincent in 2015. Preliminary data analysis demonstrates 94 % of study participants had an improved knowledge of volcanic hazards after playing the game, leading us to conclude that video games could be a logical progression for education and outreach activities.